Once again, MSNBC pretends that Bernie Sanders is done with his campaign, twisting what he said out of context in order to spread disinformation and urge him to concede (Hint: he’s not conceding before July 25th). If you didn’t think a “reputable” news source like MSNBC could stoop to the level of Fox News this year, you’re naive. This entire presidential election season has been riddled with a media blackout against Bernie Sanders of unprecedented proportion, blowing the minds of millennials and re-igniting the call to revolution by Baby Boomers and Generation Xers who believe in his message that crony capitalism and an eroding middle class has got to stop. Between ridiculously large super PACs and a hidden agenda predetermined since at least early 2015, when superdelegates were polled to the tune of almost 100% of them pledging for Hillary Clinton before the race even started, it’s obvious that the mainstream media has been bought and paid for by the Clinton campaign. 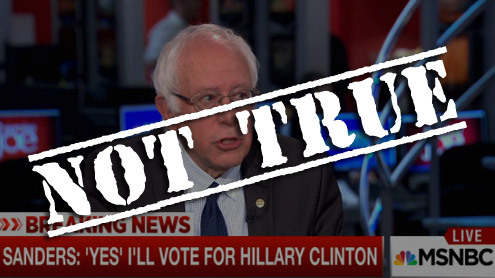 That’s why, when asked if he would vote for Hillary Clinton in November to defeat Trump and Bernie Sanders gave a hypothetical “yes” to the newscasters at MSNBC’s Morning Joe this morning, I was not shocked to see the channel immediately post “BREAKING NEWS — SANDERS: ‘YES’ I’LL VOTE FOR HILLARY CLINTON” at the bottom of the screen. This is the sort of sound bite they’ve been foaming at the mouth for since long before the California primary and, in their minds, they finally got it. The sad part is that any loyal fans of the news station tuning in without their volume up wouldn’t have heard Sanders go on to explain how, right now, the importance should be on turning the Democratic Party in a party that actually represents the people. The newscasters have a hard time moving on from Bernie’s answer, and that’s because they don’t want to talk about what he’s talking about. All they care about is ratings, and that’s because they make more money than the average working class American. This attitude from the mainstream media makes Bernie’s very presence only that much more defiant and strengthens his platform. They are giving him a medium in which to reach a very large audience, something they’ve barely done over the course of the 2016 primary season.